Xubuntu: Wenn Dockbarx Thunar oder das Terminal nicht startet. Es folgt ein einfacher Tipp, um Thunar oder das Terminal an die DockbarX zu pinnen. The popup showed no title when hovering the icon of the running Thunar or xfce4-terminal. 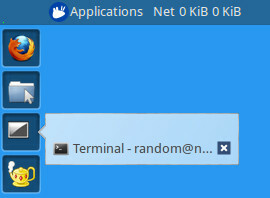 I tried „pin application“ via right click on Thunar or the xfce4-terminal and then closed it. I could not restart the program by clicking the icon. Nothing happened. Do the same for debian-xterm or debian-uxterm if you have problems with these applications and DockbarX. Thank you so much for the tip! This was really frustrating me. It works just fine, thanks ! Yes! Thank you so much for this fix.